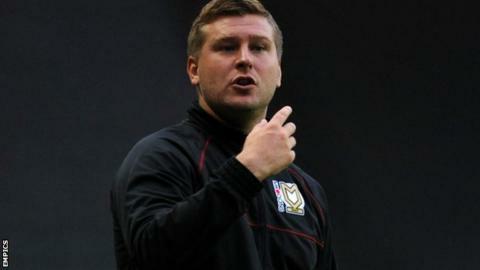 MK Dons boss Karl Robinson is looking to add extra pace to his squad despite their impressive start to the season. Robinson opted to sign experienced players over the summer and it has paid off with the club fourth in League One. Now, however, his focus has changed and he wants someone to feed off the main striker or attack down the flanks. "I want a young player who can maybe stretch the game a little bit, whether from a wide position or up front," Robinson told BBC Three Counties Radio. "They could come off the bench and give us that pure pace, which I don't think we've got apart from Powelly [Darren Powell] and Bowds [Dean Bowditch]. "We've got very gifted footballers but I want to improve - I'm constantly being a pain to the chairman. "I want to be successful for the club and the fans and I wouldn't be doing my job if I wasn't pushing boundaries that I feel I have to," he said. The 32-year-old became the league's youngest manager when he was appointed in 2010 and as well as improving the team, which reached the League One promotion play-offs last season, he is also focused on developing his own skills. The Dons face Premier League Sunderland in the Capital One Cup on Tuesday evening and Robinson plans to seek advice about the art of management from opposite number Martin O'Neill, despite trying to put one over on him in the game. "Ultimately, if I become a better manager, the club becomes a better football club and becomes more successful," he added. "It's my job to constantly keep pushing my own skills because it's only going to improve what we do on the pitch, and that's the most important thing."